Come stargaze with us at Jazz Under the Stars, our (near) monthly FREE public stargazing event! Our astronomical communities are in need of technicians who can operate observatories equipped with very sophisticated imaging instruments. Therefore, there is a need for individuals specifically trained to operate modern-day observatories. The purpose of the Astroimaging and Observatory Operation Certificate (AOOC) is to provide students with theory and experience, enabling them to operate complex astronomical equipment. AOOC accomplishes this through training on the operation of various telescopes, such as the 20" Ritchey-Chretien and the TEC140 refractor, and techniques of celestial observation. AOOC is designed to introduce students to the underlying principles of different imaging techniques during hands-on training sessions with different imaging instruments. Imaging techniques include spectroscopy, photometry, and astrophotography. 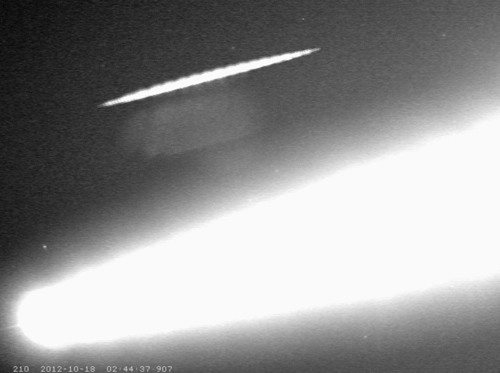 In connection with Peter Jenniskens, Senior Research Scientist at SETI Institute, our observatory's CAMS video camera captured the bright fireball over the Bay Area on the local evening of 10-17-12. The looping video shows the Oct. 17 fireball, with a field of view ~28 degrees. Special thanks to Dave Samuels in processing/managing CAMS data. See the latest CAMS update. We image nightly with a single, Watec 902 H2 Ultimate video camera, producing a 26.8 x 22.1 degree FOV centered on Azim (deg) 263.205, Elev (deg) 47.283. Processed data is available for student analysis, and sent to Dr. Jenniskens. Check out this sample video of the Quadrantids meteor shower taken January 4, 2012. CAMS video camera mounted outside CSM Observatory. Our 20" Ritchey-Chretien telescope from RC Optical Systems delivers quality images of the night sky. The RC sits atop a Paramount ME mount for location and tracking of distant objects. Attached is an SBIG STL-6303 CCD camera for imaging deep sky objects and measuring stellar magnitudes. A 500mm Borg refractor rides "piggyback" on the 20." Students and visitors enjoy superb views through our refractor. The TEC yields the best planetary views in the observatory. Visitors to "Jazz Under The Stars" also enjoy close-ups of lunar craters and mountains. Our observatory is of the roll-off roof design. Therefore, it does not look like the typical domed observatory. An advantage of this design, is that more telescopes can be used simultaneously. In addition, the observatory can quickly reach thermal equilibrium. This results in steadier views through our telescopes. The dobs are used in the ASTR 103 observational lab, as well as for public star parties. The Meade 8" SCT is used primarily for the SGS spectrograph and the TEC refractor for imaging and photometry. The only scopes not actively used are the Clark and Unitron refractors (The Unitron needs some updated equipment while the Clark is our museum piece, located in the planetarium).